I was at a place which I was sure my father, had he been at that very moment there with me, would have described as ‘heaven’. As for me, I was still trying to find the right word. 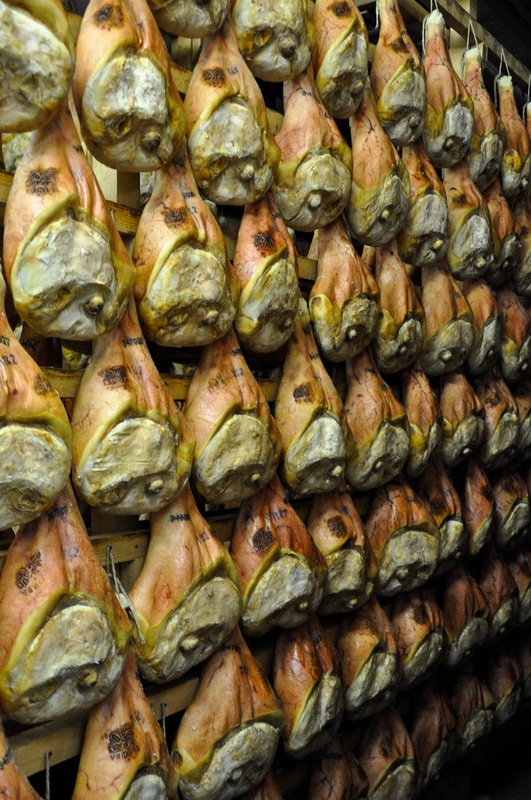 All around me and above my head thousands of legs of prosciutto were hanging still. Their cloying smell had permeated the airing chamber and enveloped me tight as soon as I walked in. There was something both glorious and unsettling in the sight in front of me. Glorious, as I was witnessing first hand the maturing process of these finest prosciutto legs – one of the most strictly controlled food products in the EU produced to exacting standards, requirements and parameters and following centuries-old dry curing techniques. Unsettling, as nowadays we have become so detached from food and where it comes from, that when we pick the readily sliced and packaged meat from the supermarket shelves, we seldom think that, actually, this is the flesh of an animal. And there was no escaping the fact that here I was surrounded by lots of flesh. The hams of thousands of pigs, to be precise. This is one of the things I appreciate about Italy. Life here brings you back in touch with food and how it is made. There are no secrets or, at least, not as many as the ones disguised by the attractive shiny packaging printed all over with chatty marketing blurb which covers highly processed products. In Italy it is easy to find food in its whole, unaltered state with the minimum number of food miles behind its back. Locally grown and reared food is widely available even in the largest supermarkets. It is also celebrated with towns and villages organising festivals to honour their own produce. A marquee with food stalls is erected on the main square, entertainment is organised and for a weekend or even for a week or two people gather together to sample different dishes, to meet different local producers and to enjoy some family and community time. 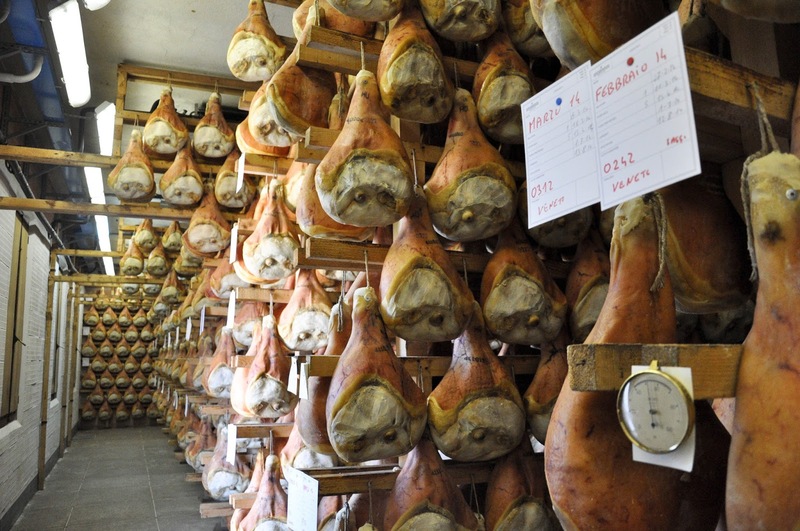 I was at one such happening – The Prosciutto Festival of the medieval walled town of Montagnana – when the opportunity to visit the premises of a local prosciutto-maker arose. As part of the festival the prosciuttifici of the area had opened their premises for the public to see how their local delicacy is made. As Italians take an active interest in what they eat, all slots had been booked in advance. Eventually I managed to secure a place for my husband, our little daughter and I on the last tour of the last day of the festival. This is how at 5 pm on a hot and sunny Sunday afternoon we found ourselves at the premises of Attilio Fontana Prosciutti SAS – an almost 100 years old prosciutto maker in Montagnana in the Northern Italian region of Veneto. Our guide – a young chap in a white overall – addressed the group and gave us a quick overview of the prosciutto-making process. 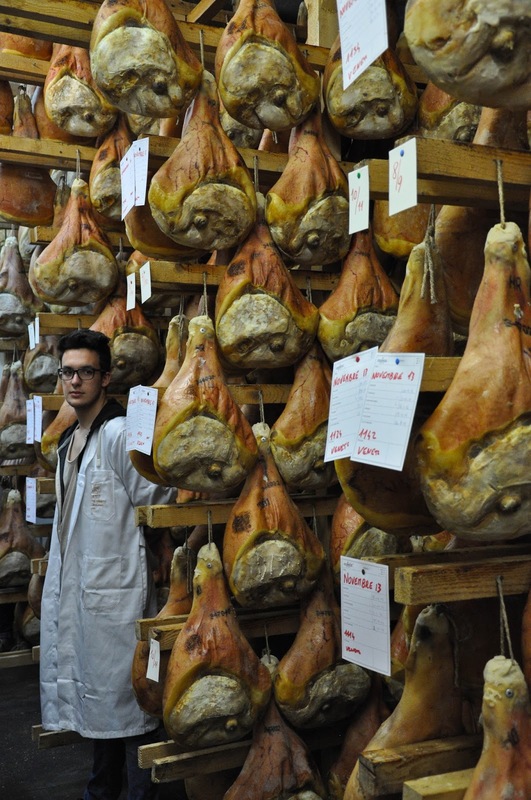 ‘To get excellent prosciutto, you need meat of excellent quality to start with,’ he said. So, first the hams are carefully selected and then they are cleaned and salted. At this, our guide slid away a heavy door and showed us the chamber where the hams were laid down covered in sea salt. They were still quite plump and fleshy with the salt just starting its drying and preserving work on them. 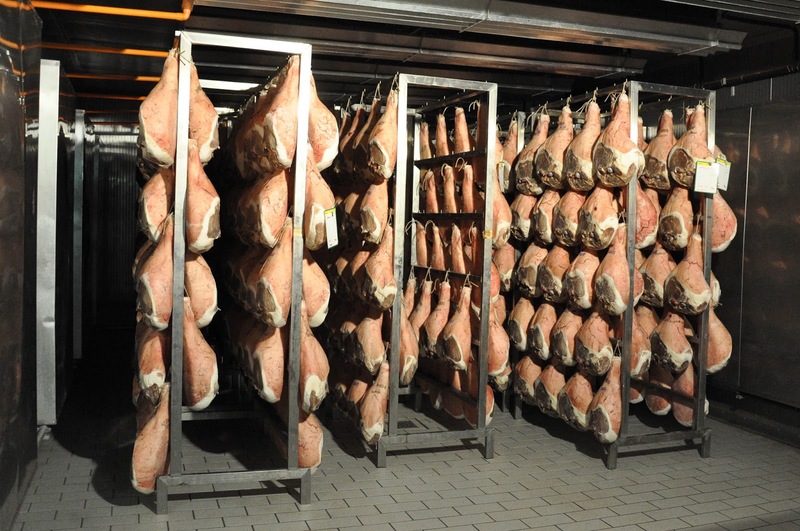 In this environment the hams spend about two months. Next, they are washed to clear the salt away and hung in a dark cold cell to dry. Our guide opened another door. 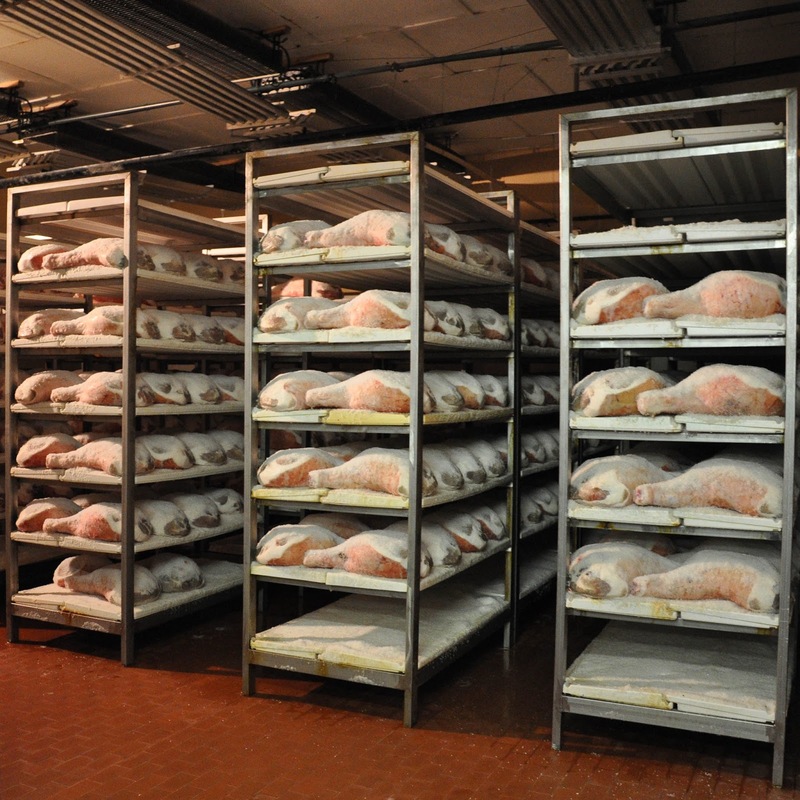 Once the hams reach the end of their stay in the cold cell, the exposed fleshy area gets covered with a mixture of flour and fat. They are then moved to the airing chamber where they spend a year or more in order to mature. We walked up several steps to the very top of the building to reach the airing chamber. Our guide let us in. My first reaction was a very basic ‘Wow!’ provoked by the sheer number of prosciutto legs hanging around me. My thoughts then progressed further and I admired the apparent simplicity of the curing process which requires only two ingredients – ham and sea salt – coupled with the right environment and a length of time to produce a fabulously soft and sweet delicacy which melts on the tongue and makes you sigh with delight. Our guide kept talking, giving us more and more details. For example, he explained how, once the curing process reaches its end, the prosciutto leg can be sold with or without the bone. With a bone, a leg could be anything between 9 and 11 kg. 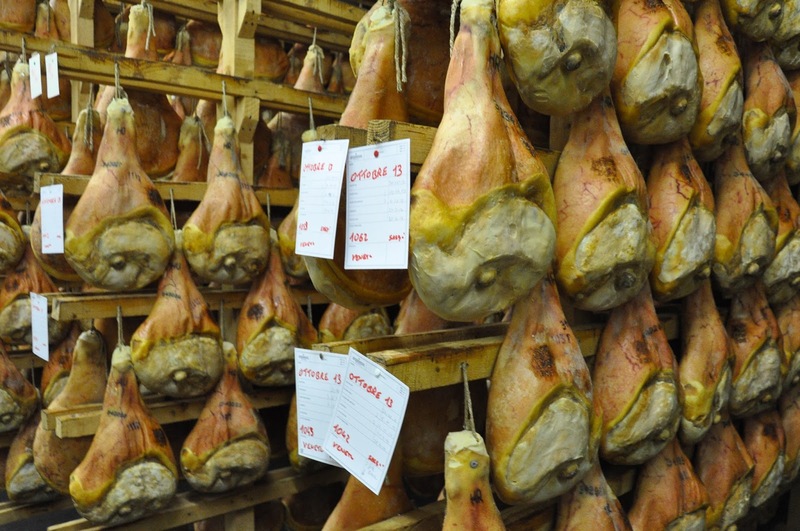 If the bone is removed, then the prosciutto is sewn up and its weight could be from 6.6 to 8.2 kg a piece. 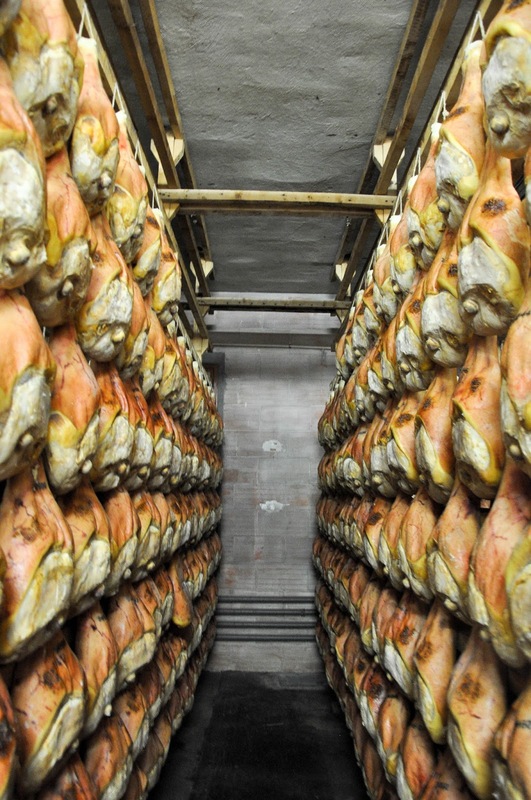 Surrounded by thousands of prosciutto legs and enveloped in their overpowering sweet smell, I thought of my father and how much he would enjoy a visit to a prosciuttificio. He loves telling me stories of the harsh winters of his childhood when his grandfather would place the hams of a freshly killed pig in a cask with salted water to cure them and turn them into the softest and most beautiful meat my father has ever tried. He still has a hankering for it. I remember spending an afternoon with him in a jamoneria in Madrid some years ago, sampling the different jamones they had. Nothing could match his childhood memory. 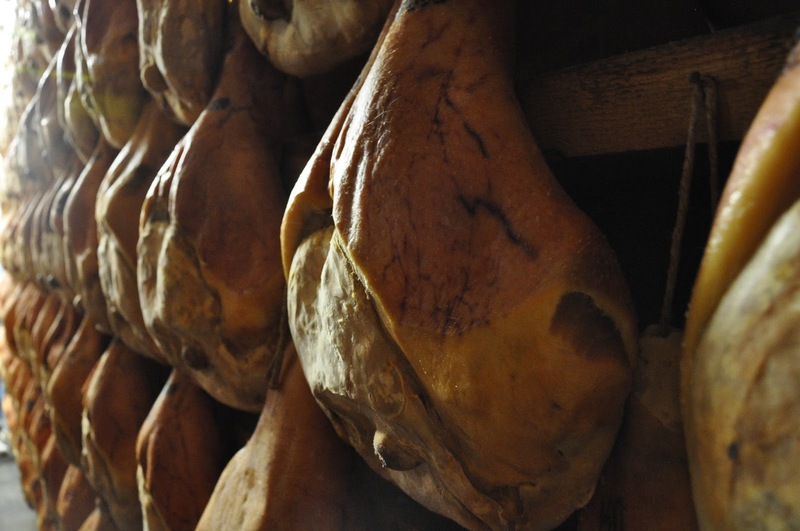 At that moment in the airing chamber somehow in my heart I was convinced that the prosciutto of Montagnana could rise to the task.